From FHB Resistance QTLs to Candidate Genes Identification in Triticum aestivum L.
Fusarium head blight (FHB) caused by Fusarium graminearum is a worldwide destructive disease affecting cereals such as wheat. FHB resistance is a quantitative trait, and information for FHB resistance QTLs in wheat is available. 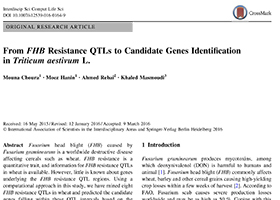 However, little is known about genes underlying the FHB resistance QTL regions. Using a computational approach in this study, we have mined eight FHB resistance QTLs in wheat and predicted the candidate genes falling within these QTL intervals based on the available sequences and markers. A total of 18 genomic scaffolds located at chromosomes 2AL, 2DL, 3B and 4BS were prioritized to harbor FHB-resistant candidate genes. These genes are mainly involved in plant defense response, immune regulation and cellular detoxification. We believe that our results constitute a starting point for further validation to improve FHB-resistant bread wheat varieties.